Successfully Added Tension-Relief Acupressure Head and Eye Massager with Soothing Music to your Shopping Cart. 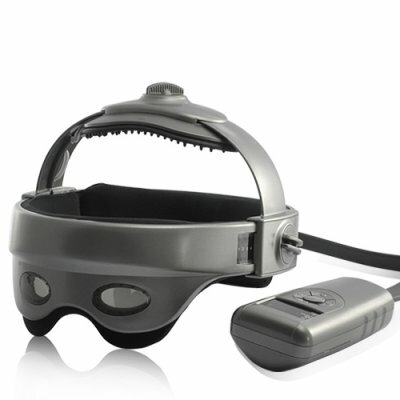 Comfortable and portable, this tension-relief acupressure head and eye massager revitalizes your brain and mind whenever you need it. Inspired by popular Meridian treatment (Chinese medicine), this acupressure head and eye massager is designed with multi-directional airbag kneading around the head area and with acupuncture points on the top area. It helps open the head meridian and enhance blood circulation, remove eye fatigue and improve eyesight. The multi-point acupuncture on the top and rear area of head increases the oxygen exchange function of the brain, eliminates pain and tension on head, and brings relaxation to the whole body. Finally, ancient Chinese medicine merges with modern technology to improve life. With eight different types of light wave music to choose from, the built-in soothing sound of this massager resonates within your brain, relieving stress, and promoting self-recovery of your brain cells. In addition, the massager also comes with a heating function to provide you with a soft warm feeling, which in turn promotes the blood circulation around the head and eye area, and further release stress and fatigue. Buy one for yourself and stock up your online store with these popular products to lock in some serious profits! Brought to you by your reliable source for high - tech electronics, Chinavasion.